Organizers prepare for the turkey drive in 2015. WOODLAWN — A Muslim group is more than tripling its past charity efforts and giving out more than 5,000 free turkeys to needy families at schools on the south lakefront Tuesday. The Sabeel Food Pantry will continue a 15-year tradition and pass out the Thanksgiving turkeys at eight schools starting at 9 a.m.
Dr. Jihad Shoshara, the lead coordinator for the past 10 years, said it's a way to give back to the community in a way that boosts a sense of respect by allowing people to join in on an American holiday that otherwise couldn't. "It's not just charity, it's something that really means something to people," Shoshara said. "They can now do what other Americans are doing all across the country." Organizers said that the drive shows how Muslims for years have been ingrained in the fabric of American society and the effort runs counter to the portrayal of Muslims during the election year. 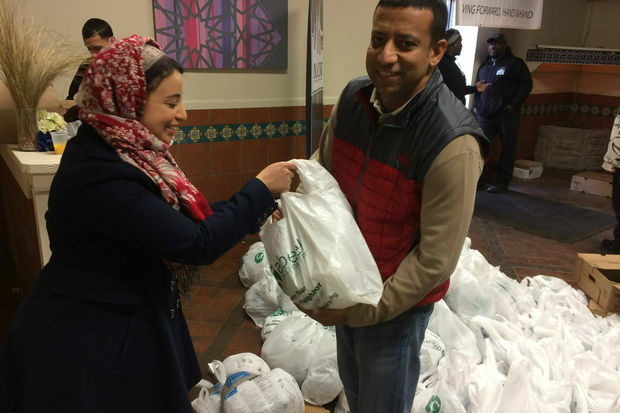 "In this year of divisive political rhetoric which has stoked misperceptions and stereotypes of Muslim Americans, this is a clear example of Muslims not only giving back but leading the effort of giving back and extending a helping hand," organizers said in a press release. In a video of last year's effort, turkeys were passed out with a card that said, "Happy Thanksgiving From Your Muslim Neighbor." Shoshara, a who attended CPS as a child, said the schools have found a way to get closer to the community as well. Shoshara said that parents who come to parent-teacher conferences get a ticket to jump to the front of the line during Tuesday's give-away and it has caused attendance to shoot up at the conferences. He said the Sabeel Pantry, 3031 W. Belmont Ave., has been able to more than triple the number of turkeys to 5,000 from 1,500 last year thanks to a matching grant from the Islamic Food and Nutrition Council of America, a nonprofit that is the largest halal certifier in the country. Turkeys will be available until supplies run out. • Dulles Elementary School, 6311 S. Calumet Ave.
• Emmett Till Academy, 6543 S. Champlain Ave.
• South Shore Academy, 1415 E. 70th St.
• Wadsworth Elementary School, 6650 S. Ellis Ave.
• Woodlawn Community Elementary School, 6657 S. Kimbark Ave.